What is War Eagle Parking? War Eagle Parking is a next generation parking solution that provides students and faculty real-time occupancy information for parking decks and outdoor surface lots. Searching for a parking place is a burden that often takes up far too much of drivers’ valuable time and unnecessarily eats into their fuel costs. War Eagle Parking strives to lift that burden using FoPark—an innovative technology that shows drivers the availability of open spaces in a parking lot in real time on their smartphones, tablets, or computers. Using cameras installed in a parking lot, War Eagle Parking uses digital video parsing technology to process live video streams that accurately monitor open or filled parking spaces in a lot or deck. 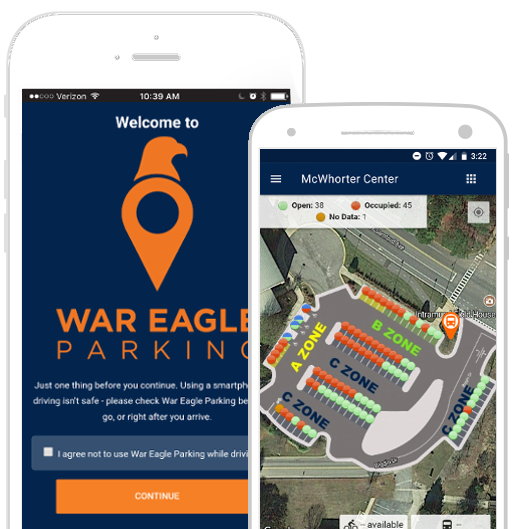 A user can access the technology via the War Eagle Parking app on his or her smart phone or tablet to reveal the location of available spaces, the length of time cars have been parked and other useful information for both the customer and parking manager. War Eagle Parking and FoPark are engineered by Focus Engineering, with web and mobile development by McNutt & Partners. War Eagle Parking’s intelligent system records information regarding when the car was parked in a spot, how long was it parked and when it left the spot. This data is presented to the users in the mobile App and the website in an intuitive and easy to use layout. Please us the contact form below to contact us today with any questions you may have about War Eagle Parking or to provide feedback on the app. We value your feedback and hope to continue developing the app and bringing new features and utilities.